Dual Racor fuel filter located in the salon area for easy access. The house battery system consists of 6 - 6 volt AGM batteries and one separate 12 volt Lifeline AGM battery for engine starting. The battery charger is a Xantrex Statpower TruCharge -40 amps. The main and all head sails are Dacron plus an asymmetrical spinnaker with sock. The 160% genoa is on the furler and a storm jib is included plus a Yankee high top. The furler is a Harken Cruising 2. The vessel was built in Sweden and designed by Bruce Roberts. All fiberglass was hand laid up and overall construction was done to ABYC recommendations. Moving into the boat interior from the cockpit you step into a large area that includes a stand up nav station. There is a pilot berth to starboard and two quarter berths aft. There is access to the steering quadrant aft of the steps from the cockpit. The emergency tiller is also located in this area. Moving forward, the galley is to starboard and is u-shaped with plenty of handholds. To port you find more galley storage and the wall-mounted Fab-All Balmar 120 - diesel fired cabin heater. Forward of the galley is the convertible dinette and to port are upper and lower berths. The lower converts to seating and the upper folds away when not in use. Moving forward, the head is to starboard and hanging lockers to port. The head is large with a full -width vanity to starboard and plenty of room to shower. The forward stateroom has two berths. The starboard berth is lower and the port berth is located above several drawers and storage areas. From the forward area back to the galley the floor is one level making it easy to move in heavy weather. there is one step up to the nav area with plenty of room for two or three people to get in out of the weather. There are two Johnson 2200 GPH 12 volt submersible bilge pumps with auto switches and a high water alarm. A Rule 1100 GPH submersible pump for the shower sump. Plus a manual Whale Gusher diaphragm pump is used for the shower area and connected through a "Y" valve for holding tank discharge. This Bruce Roberts 45 is a true offshore vessel with a proven record of cruising. This Bruce Roberts design has a modern long fin keel extending into a full-structured skeg with an inboard hung rudder attached. The bow is raked while the stern is reversed with a counter overhang and a fitted swim ladder. There is an open foredeck with wide side decks that lead aft past a low-profile trunk cabin amidships. and a raised deck salon to an aft cockpit. A Fleming self steering unit is included. The lifelines have a solid stainless steel upper rail with intermediate cable. The teak deck overlays were removed and replaced with fiberglass nonskid. The interior is no nonsense -- two large quarter berths, upper and lower berths in the saloon plus a convertible dinette. There are also two single berths in the forward stateroom. A very large nav station is located just inside the companionway. A very workable galley is just forward of the nav station. The Westerbeke 70 HP engine is located under floor in the nav area. All flooring comes up for easy access. If you want to cruise the open ocean or just the islands, this is a fine boat for the purpose. It is located near our office in Seattle for easy showing. Give us a call. 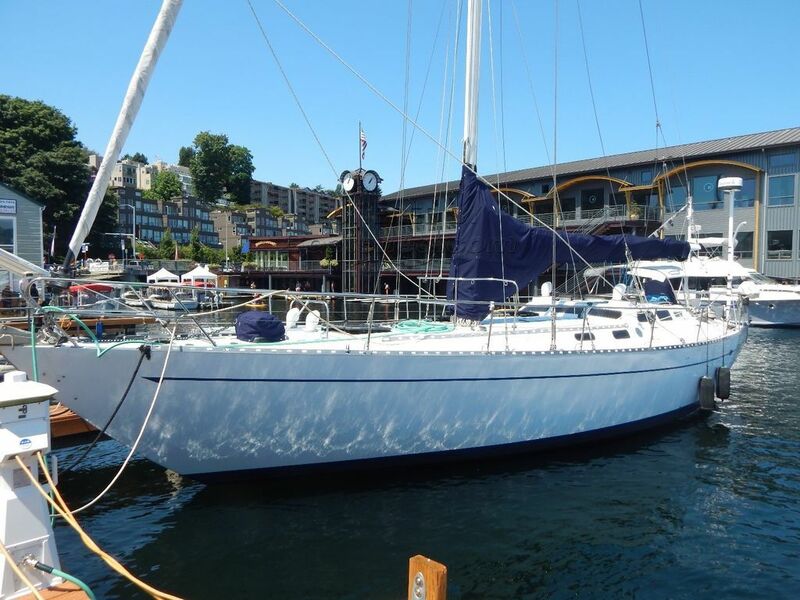 This Bruce Roberts 45 Offshore Cruiser has been personally photographed and viewed by ROGER DRILL of Boatshed Seattle. Click here for contact details.